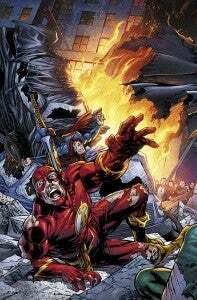 DC Comics Presents will end in April with the series' 20th issue, #19, according to DC Comics's solicitations for April product. The solicitation, which depicts half of a gatefold cover showing the Justice League seemingly wiped out by an unseen hand, asks "what time displaced-hero has arrived on our world—and is the destruction he brings the herald to a great disaster?" There are a handful of options here, of course, but it seems most likely with a teaser like that we might see Kamandi, a popular Jack Kirby creation who's been absent since the launch of the New 52 and whose title took place in the future, after an event called the Great Disaster. Almost every time-traveling hero in DC's pantheon has encountered that disaster at one point or another, though, and it was in fact the premise of Final Crisis. Check out the final solicitation information below.